Trooprock Aussies: 2015 On the Road Again! But not capitol of the universe. Been a while since I've thrown down a good ol' blog! Jen and I had an amazing end of the year 2014 in the USA jumping out of planes, riding roller coasters in the shopping centres and eating too many Buffalo Wings. After that we went to the UK and had a crack at living over there, but the beauty of Aussie pulled us back home! A new windscreen and set of leaf springs see's us returning to the nomadic life in our troopy camper, Rocky! Jen on the new Breakwall. To begin our trip we decided we'd both see some of our extended families. First stop was Gunnedah, which is the Koala capitol, not just of Australia, but the world! Jen's family made sure we ate plenty of delicious Wagyu Beef! Driving off to Coffs to visit my nan and get some ocean time with a quick stop in at Bellingen lollyshop (for my nan of course)! Since my last visit, a new breakwall had been put in on the south side. So after a swim we went to discover the secret of the big colourful plasticy looking construction up the end of the new wall. Try throwin' this one on the barbie! 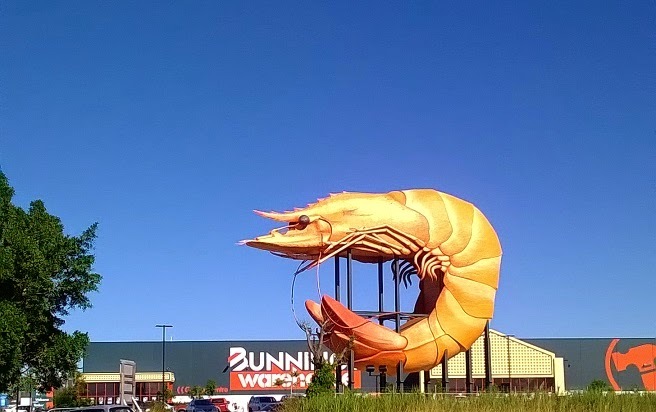 The next day we continued a bit further up the coast to discover the giant prawn of Ballina had gone mass corporate and allied itself with Bunnings Warehouse! Further up to Lenox Head, good weather and no sharks, stingers, jellyfish, crazy waves or "octopus sightings" are something we were enjoying very much outside of poor old Newcastle which had the beaches seemingly shut all summer! After a cleansing swim we crossed the road by the beach to hop in the "Coca Cola" Lake (Lake Ainsworth) which is a freshwater lake just by the ocean. It is nicknamed the Coca Cola Lake as it surrounded by melaleuca gums and the oils run into the lake giving it a brown colour and pleasant fragrance. A dip in the ocean followed by a melaleuca bath is an incredibly refreshing and cleansing! 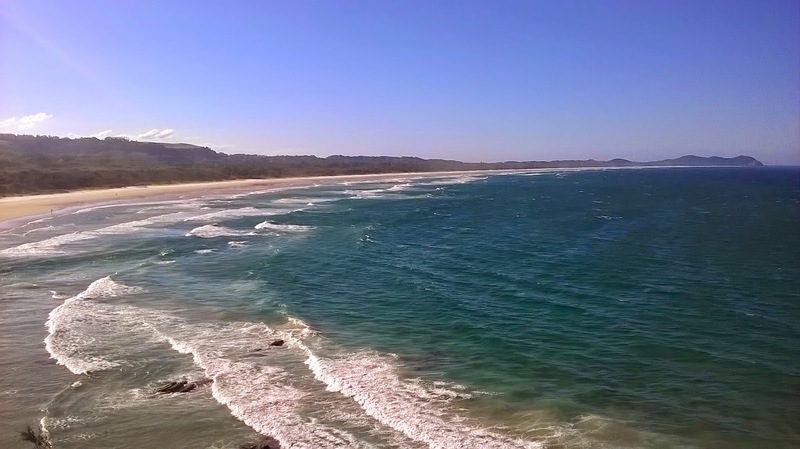 As Jen had not been to Byron Bay before, we made the executive decision to stay in the area for a few nights. 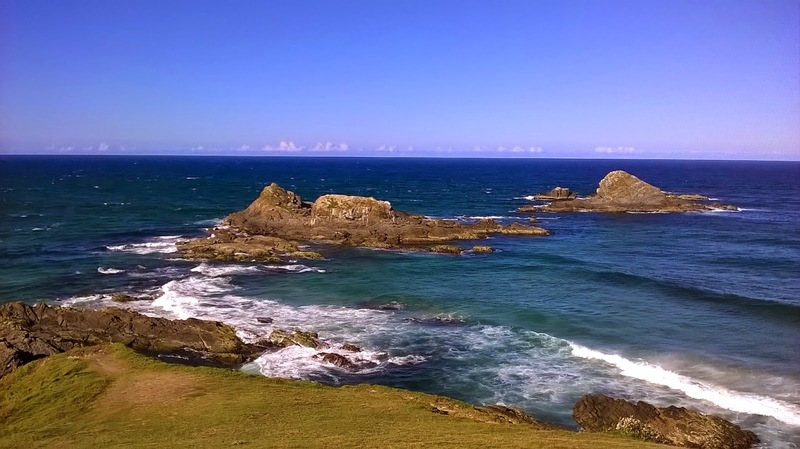 We stayed at Broken Head, which is just south (10 minute drive tops into the town). A sensational place. Broken Head is a rainforest national park, much quieter than Byron itself and the caravan park there is close to the beach and has a nice little walk around the side of the national park. The beach has very powerful rips, however the water is very shallow. You can walk down to the headland and just out there are 2 large rocks, which according to Arakwal creation stories is 2 sisters. The 2 sisters decided to go swimming and got cought in a powerful rip which took them out to sea and turned them to stone. It's a good simple story of the land telling you not to swim too far out or you will be taken by the ocean. The weather during our stay was perfect and we got some well needed beach days in! Byron Bay was amazing and Broken Head was a perfect homebase for a less busy, more relaxed stay in the area!